Vitiligo is a disorder in which white patches of skin appear on different parts of the body. This happens because the cells that make pigment (color) in the skin are destroyed. The cause is not known. Vitiligo may be an autoimmune disease. These diseases happen when your immune system mistakenly attacks some part of your own body. In vitiligo, the immune system may destroy the melanocytes in the skin. It is also possible that one or more genes may make a person more likely to get the disorder. 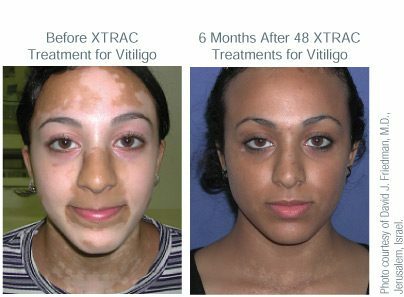 Current treatment options for vitiligo include medical, surgical, and other treatments. Most treatments are aimed at restoring color to the white patches of skin. Dr. Jochen can also treat vitiligo with our XTRAC laser, read about this laser here. In some cases, the disease is so advanced that it is likely that the pigment will not return, in these cases, the option to bleach out the rest of the skin is a result.